Poker has a new triple crown winner. The name, Harrison Gimbel. After a near 14-hour grind on Day 3 of Event #68: $3,000 No-Limit Hold’em where Gimbel returned as the second shortest stack out of 37 players, Gimbel defeated Chance Kornuth heads-up to claim his first World Series of Poker bracelet and the last missing piece of poker’s triple crown. 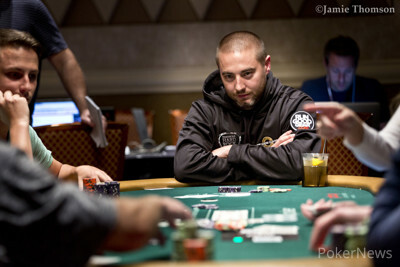 Gimbel earned a score of $645,922 but most importantly, he won his first WSOP gold bracelet. Kornuth received $399,132, just missing out on his second WSOP title. 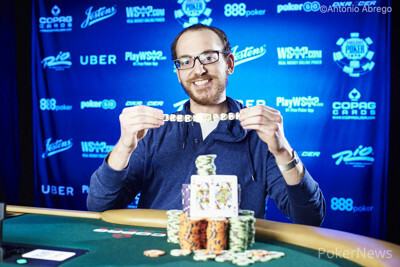 With the win, Gimbel more than triples his career WSOP earnings. Currently sitting at $207,606, the best of Gimbel’s 19 cashes came with his deepest run when he finished fourth in a $1,500 Ante Only event back in 2012. Entering the day at the very bottom of the leaderboard, Gimbel found aces early to double through Konstaninos Nanos and a little while after came from behind to double through Matt Salsberg finding a jack with king-jack against Salsberg’s ace-ten. Gimbel then leaped up the board with a massive pot against Jia Liu. Gimbel four-bet jammed all-in with ace-eight and Liu put him at risk with ace-queen. Gimbel made a miracle straight on the turn and took over the chip lead. Many notables fell as the field thinned before the final table. Ryan Laplante (32nd - $15,806) went out early, as did Daniel Negreanu (29th - $15,806) and Kevin Saul (28th - $15,806). Nanos (15th - $29,878) and Salsberg (13th - $29,878) made it a bit deeper but ultimately fizzled out. Action at the final table got underway quickly. Before the official final table could even be set two players were busted on the same hand. Falling toJohn Griffin, both Florentino Coalla and James Gilbert were removed when they ran into Griffin’s pocket kings. On just the second hand of the final table, Kris Homerding fell to Chris Farmer. Twelve hands later the first of the two Brazilians were eliminated as Vinicius De Silva was busted by Griffin. Quite a while passed before the second Brazilian, Enio Bozzano departed, becoming Gimbel’s first casualty. Gimbel went right back to work taking out Farmer in fifth. One-time chip leader Griffin was the next to go; he made a move on the river after flopping a pair of aces but Kornuth flopped a set and Griffin was snuffed. 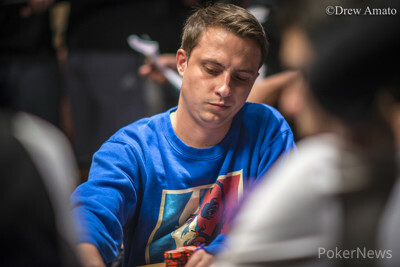 Ryan Van Sanford was the last player to be eliminated before the heads-up battle began. Van Sanford got his chips in good with ace-queen but Kornuth flopped a pair with ace-jack and his run came to an end. The heads up battle only lasted seven hands. Gimbel doubled up on the third hand to draw even and a few hands later a sick cooler ended it all. Kornuth ran pocket tens into Gimbel's pocket queens and Gimbel had Kornuth out chipped by a single ante to claim the win. Hand #126: Chance Kornuth opened to 400,000 and Harrison Gimbel three-bet to 1,200,000. Kornuth four-bet, making it 2,660,000 and Gimbel five-bet shoved. Kornuth called. A sick cooler for the bracelet was a board away for Gimbel. The dealer fanned out and Kornuth's run came to an abrupt halt, falling in second place. 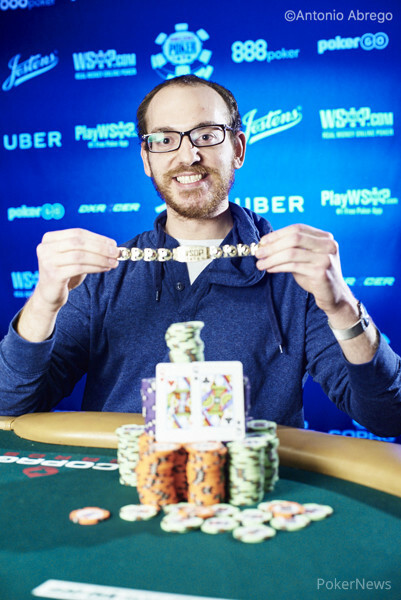 Kornuth takes home $399,132 while Harrison Gimbel becomes a new WSOP champion, banking $645,922 and a shiny, new gold bracelet. Hand #120: Chance Kornuth opened to 320,000 and folded when Harrison Gimbel three-bet shoved. Hand #121: Gimbel opened and Kornuth folded. Hand #122: Kornuth opened to 400,000 and called Gimbel's three-bet jam. The board ran out and Gimbel dodged Kornuth's flopped flush outs to score a huge double. Gimbel's all-in was for 4,660,000. Hand #123: Gimbel bet 320,000 and Kornuth called. The flop was and both players checked to the on the turn. Kornuth bet and won the pot. Hand #124: Kornuth opened to 400,000, Gimbel three-bet to 1,200,000 and Kornuth called. Gimbel bet 500,000 on the flop and Kornuth folded. Hand #125: Kornuth got a walk. Ryan Van Sanford shoved from the small blind and Chance Kornuth called from the big blind. The board ran out and Kornuth caught his jack to eliminate Van Sanford. Hand #109: Harrison Gimbel moved all in and won the pot. Hand #110: Chance Kornuth got a walk. Hand #111: Kornuth limped the small blind and Gimbel checked. The flop was and a bet from Kornuth took the pot. Hand #112: Kornuth moved all in and won the pot. Hand #113: Kornuth got a walk. Hand #114: Kornuth shoved and Gimbel called. Kornuth had and Gimbel . The board ran out and Ginbel doubled up. Hand #115: Kornuth shoved from the button and won. Hand #116: Van Sanford moved all in and won the pot. Hand #117: Kornuth made it 480,000 from the small blind and took the pot. Hand #118: Kornuth opened for 320,000 and folded to a Gimbel shove. Hand #100: Ryan Van Sanford open-jammed all-in from the small blind and Chance Kornuth called in the big blind. The board ran out and Van Sanford scored the double up. His all-in was for 1,585,000. Hand #101: Kornuth took down the pot with a bet on the flop. Hand #102: Kornuth opened to 435,000 and won the pot. Hand #103: Kornuth opened and won the blinds and antes. Hand #104: Kornuth was given a walk. Hand #105: Van Sanford open-jammed and won the pot. Hand #106: Van Sanford was given a walk. Hand #107: Harrison Gimbel limped and Kornuth checked. The flop was and Kornuth bet 120,000. Gimbel called. The fell on the turn and both checked to the on the river. Kornuth bet 245,000 and won the pot. Hand #108: Kornuth opened to 405,000 and Gimbel called. The flop was , and both players checked, getting the for free. Kornuth bet 600,000 and Gimbel called. The completed the board and Kornuth bet 1,000,000 and Gimbel called. Kornuth tabled and Gimbel mucked. 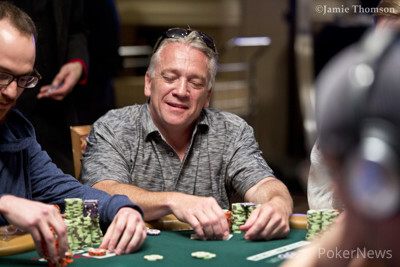 Hand #99: Chance Kornuth opened to 260,000, and John Griffin called in the big blind. The flop was , and Griffin check-called a bet of 350,000. The turn was the , and Griffin check-called a bet of 655,000. The river was the , and Griffin checked again. Kornuth bet 2,000,000, Griffin moved all in, and Kornuth called. Kornuth had while Griffin had . Griffin was eliminated in fourth place. Hand #92: Chance Kornuth opened to 240,000 and folded when Ryan Van Sanford moved all in. Hand #93: John Griffin opened to 275,000 from the button, and Kornuth called from the big blind. The flop was [kjhac5d], and Kornuth check-folded. Hand #94: Griffin made it 250,000 and took the pot. Hand #95: Kornuth raised to 260,000 and won the pot. Hand #96: Griffin opened to 275,000 from the small blind, and Van Sanford called from the big blind. The flop was , and Griffin check-called a bet of 175,000. They both checked the turn, and on the river, Griffin checked. Van Sanford bet 425,000, then folded to a shove from Griffin. Hand #97: Kornuth got a walk. Hand #98: Griffin made it 275,000 and folded to a raise from Kornuth.